Sveta Troitsa Church is one of the symbols of Bansko, along with its tower and unique ring of the bells. Preparation for construction of the church began around 1810. The location for its construction was chosen, one at the very center of the village. The site for its construction was donated by the people of Bansko, the first donor being Dyado Lazko. 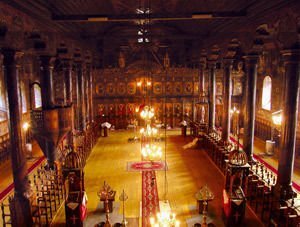 In the years of Ottoman rule there was a law stating that a church could only be built where there had previously been a church already. To get it built, Bansko villagers secretly buried a cross and icon at the chosen spot. Another requirement according to Turkish laws was that a church could be no larger than a mosque. Based on the pre-planned project, the church was intended to be much larger and more spacious than a mosque, which would have led to conflicts with the Ottoman authorities. As a result, church supporters prepared a diplomatic move - the condition was that they would include a Turkish religious symbol in the new church. Ultimately they had a cross illustrated on the large stone above the main entrance of the church, along with a crescent and star on either side. Later, when Sveta Troitsa Church was actually built, it was ordered to be demolished, because Jesus could not have a temple larger than Muhammad's. Bansko residents once again acted with diplomacy, responding that since it had both a cross and crescents the temple was for both. And so the church survived to the present day. Permit for construction of any church had to be granted by a sultan's missive. To reach the sultan, the request had to be sent to the pasha in Thessaloniki. The requirement was for the request to also include gold coins. Dyado Lazko knew that this would not be enough for the application to be approved, they had to wait for the right moment. And so, one day, news came that the pasha had a firstborn son. A group from Bansko headed out to give a baby blanket as a gift to the wife of the pasha. The application was then handed to him, and the pasha, touched, responded: "Please, wait for the missive." The missive was received in 1833. A list was made of all the donors. Topping the list were the biggest donors and the hadji, followed by the names of nearly everyone in the entire village. At the time, the village consisted of 3 neighborhoods, each with 100-120 houses. There was a lot of work to be done with little resources. The villagers had to find their own buildings materials, even as the money ran out. On September 15, 1834, there was another fundraiser, the people gave everything they had left. By 1835, the building's progress was noticeable. The head organizer was categorical that every able man had to be at the construction site. Construction began with 350 carpenters, stonecutters, masons and woodworkers, apprentices and journeymen, volunteers from the village. Legends spoke of how the workers expanded the site and boundaries of the church at night. Each night, the church grew by a foot. Bansko residents worked while the Turks slept, so that the latter wouldn't notice how large the base of the church would actually be. They finally ran out of funds and Dyado Lazko traveled to Nevrokop to ask for money from Altan Bey, but when he discovered what his money had been used for he ordered the organizer, Dyado Lazko, brought to him. This was the last anyone had ever heard or seen of Dyado Lazko. It is thought that he was imprisoned and later killed. 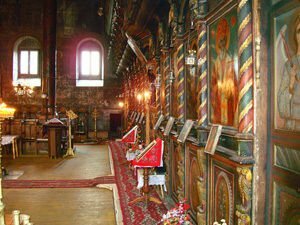 Dyado Lazko didn't live to finish his life's work - Sveta Troitsa Church. For years, there was iconography being painted and the icons collected so that the church could be finished. After another 15 years, work began on the tower, which was also built thanks to funds from the locals. 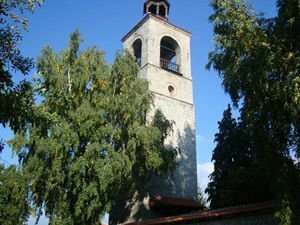 At around 1855, the two brothers Veleganovi cast 4 bells for the tower; they were asked to write in the name of the sultan, yet another diplomatic tactic by Bansko villagers, so that the Turks wouldn't ever throw the bells off the tower. Once finished, Sveta Troitsa Church stood as a pseudo basilica with a 3-part nave, built entirely of stone, 144 ft (44 m) long, 72 ft (22 m) wide, and 39 ft (12 m) tall. The building's architecture was designed so as to trick the eye into believing it is small, even though in reality that is not the case. The walls of the church are 43″ (110 cm) thick at the base, while the vaulted entrance and windows consist of cut stone. On the outside, the altar is half of an 18-angle prism, ending with a beautiful stone cornice. The construction is made of solid pine beams, interlocked in such a way that astound architects even today. The entire weight of the roof is supported by 12 columns, symbolizing the 12 disciples of Christ. The columns are made of pine, wrapped in rope and thoroughly doused in tar. The church has 3 entrances - the icon of Sveta Troitsa is painted above the main entrance. Under it, on both sides of the Christian cross, are depicted the crescents - the Turkish coat of arms, that saved the church from destruction. There were no murals originally. The church was decorated only around the windows with plant motifs, likely painted by the artist Velyan Ognev. The women's section is located on the west side - left and right ground floor, while above them sit 2 balconies with lattice panels. The altar stood out magnificently on this background until 1955. The churchyard is surrounded by a 13 ft (4 m) tall stone wall so that wicked eyes cannot pry into what's going on inside. Thanks to tolerance, compliance and generosity, the church survives today, to forever bring joy to each and every heart that appreciates faith, antiquity, tradition and art. 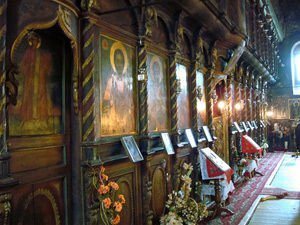 There are legends saying that there are tunnels that crisscross underneath the church and the entire old town; these served Bansko villagers to hide from invaders and for rebels to escape. Besides the well-known little doors that helped them go from house to house there are also tunnels beneath the town that lead outside of it. 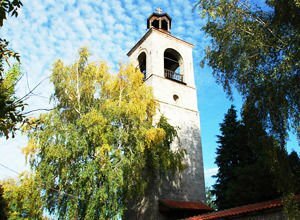 In 1850, 15 years after Sveta Troitsa Church was built, Bansko residents took it upon themselves to build a bell tower, one that would be just as magnificent and grand in structure and size as the church itself. It was built completely independent of the church in the churchyard. It is a rectangular pyramid, without any decorations, towering 98 ft (30 m) above the town, with 13 ft (4 m) stone arches opening on each of the 4 sides, allowing for a panoramic view of the entire basin. A cupola rises above the roof - a light, open-work, 6-sided structure with 6 archways, with a beautifully crafted pine cross bearing a gold leaf lightning rod at its very top. The tower of Sveta Troitsa is built entirely of large stones, having whole blocks in the corners and smaller ones in the middle. During construction, an expert builder presided over each corner, while the master mason Grigor Doyuv (known to Bansko locals as "Master Gligata") oversaw the entire project. He died in 1909 at the age of 108. At the ground floor of the tower there is a small iron-shod door, leading to a fireproof storage area. That is where the money and donations to the church were kept. Another iron-shod door and arched stone entrance leads into the tower. High up at the top, under the arches and above the veranda are the 4 bells, arranged according to size and tonality, crafted with added silver for sonority and ringing by the Bansko master bell makers in Plovdiv - Veleganovi. 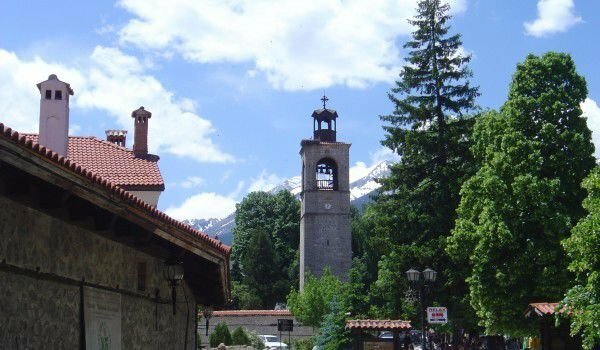 Within the tower of Sveta Troitsa Church, Bansko, there is a special area set aside for the clock mechanism, which continues to work flawlessly. The mounted clock mechanism weighs 1102 lb (500 kg). Its gears are put in motion by 2 large rectangular stones up on thick ropes. Controlled by the anchor and pendulum, the stones go down to the bottom of the tower in a wooden channel. By winding, the stones rise back up. The complex mechanism rotates the arrows in 2 opposite dials and a large hammer hits the large bell every hour. The bell toll can be heard from far away, indicating that the top of the hour has come. The creator of the clock was the famous Bansko clockmaker Todor Hadji Radonov. His clocks mark the passage of time in Petrich, Blagoevgrad, the Zograf monastery, Istanbul and many other places. The ringing of his clocks can be heard throughout the lands of Bulgaria. Today, the descendents of Veleganovi live in Plovdiv and keep the memory, as well as the relics of their renowned ancestors alive.